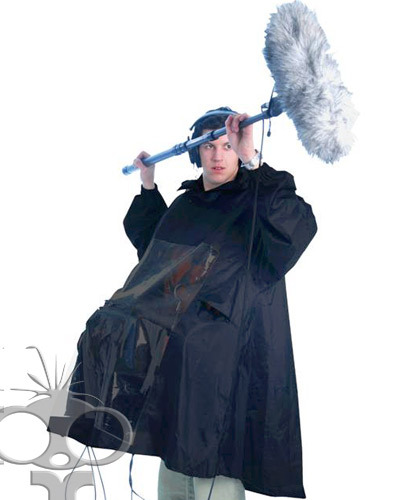 The Petrol rain poncho is the ideal way to keep yourself and your equipment dry when working with audio gear. The waterproof poncho has a transparent polyurethane front panel for maximum visibility of equipment with slotted pass-through hand opening on either side to provide easy access to controls. The poncho has a hood and roomy sleeves that make it easier to operate a boom pole. It folds down into a small drawstring mesh bag. The poncho is large enough to fit our audio bag with a mixer underneath it...it's the ideal piece of equipment for on-location sound recording.